This welcoming duplex on the north end of Studio Drive is a wonderful family beach rental. This home is located on the bluff, and features sweeping ocean views, grassy lawns, and an enclosed ocean facing brick patio. 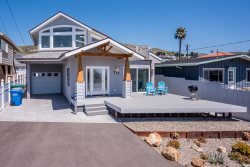 It's the perfect property for BBQing and enjoying our famous Cayucos sunsets! The interior of the home is furnished with comfortable furniture, antiques and family hierlooms. The living room has vintage knotty pine walls, large view windows, a large flatscreen tv/dvd, a piano and novel filled bookshelves to help you relax. The kitchen has granite counters, a breakfast bar, stainless steel appliances, a 5 burner cast iron stove and a convection oven. Both bedrooms have flatscreen televisions. Only 38 stairs to the sand! PRIVATE STAIRS TO THE BEACH! Don't wait!! Book today!! UNIT A: Updated 2 bedroom, 2 bath oceanfront duplex. Both bedrooms have a queen size bed and a television. There is a full size futon located between the entry and the dining room. The outdoor brick patio features a natural gas BBQ and a dining table with umbrella and chairs. A beautiful lawn faces the oceanfront and leads to private steps to the sand. The home is decorated with comfortable furniture,antiques and family hierlooms . Included are W/D, wireless internet and cable. No fireplace. We are 3 generations and all loved staying at this property. Large living area works perfectly! Relaxing in the yard while watching the grandkids play wiffle ball, dig in the sand, body surf or sit to read a book... its perfect! Very helpful staff and considerate. Set up for cooking and living, had a very comfortable week.